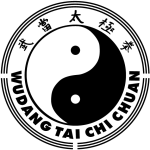 T’ai Chi [Supreme Ultimate] comes from Wu Chi [No Ultimate] and is the mother of yin and yang. In motion T’ai Chi separates; in stillness yin and yang fuse and return to Wu Chi. Once there is movement, there is separation. Once there is stillness, there is unity. There is nothing exaggerated, nor is anything lacking. Sui [follow] bending then straightening. When the opponent is hard and stiff, I am soft and pliant, it is called Zou [yielding/moving]. When I am smooth and he is not, it is called Nian [sticking/adherence]. If the opponent’s movement is quick, then I quickly respond. If his movement is slow, then I slowly Sui [follow] them. Through practise and familiarity [Zhao Shu] with the correct touch, we gradually comprehend Jin [intrinsic strength/ trained force]. From the comprehension of Jin can reach Shen Ming [enlightenment]. Without long practice one cannot suddenly understand T’ai Chi and become an expert. Empty the next and headtop of strength. The Qi [vital energy] sinks to the Dan Tian [ region of vital heat/ field of elixir]. Don’t lean to either side or forwards or back, Suddenly conceal, suddenly reveal. When the left feels heavy then make the left empty. When the right feels heavy then make the right distant. When the opponent looks up, I am still higher; When he looks down, I am lower still. When he advances, the distance seems surpassingly long. When he retreats, the distance seems exasperatingly short. A feather cannot be placed/added, a fly cannot land. A hero thus becomes invincible. Other schools of martial arts are so numerous. Slow hands surrendering to fast hands, are all the results of natural abilities and not of well-trained techniques. It is evident that we don’t use force to get the upper hand. When we observe an old man of eighty withstanding the assault of the group of people, How can it be due to speed? Sinking to one side allows movement to Sui [follow]; being double-weighted is sluggish/a hindrance. You can often see people who have practised their skills for several years, but who still cannot change and turn. This leads to their being entirely regulated by others. They are not aware of their sickness of double-weightedness. If we wish to be free from this sickness, we must know Yin and Yang. When Yang does not depart from Yin, When Yin and Yang aid one another, then we can say that we understand Jin [trained force]. After we understand Jin, the more we train, the more expert we become. Silently memorise, study and imitate. Originally it is giving up yourself to follow the opponent. Many err by forsaking what is near to pursue what is far. The student must carefully discriminate.